Above: Paige Canyon makes confluence with the San Pedro River. 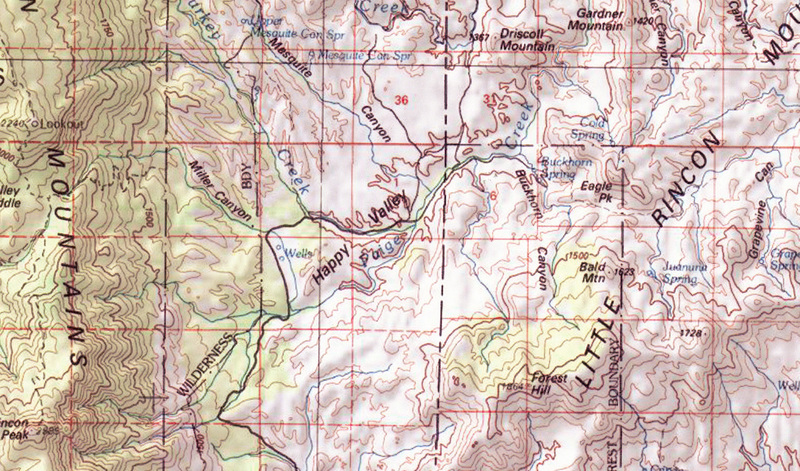 The river runs from left to right across the lower-middle portion of the page. 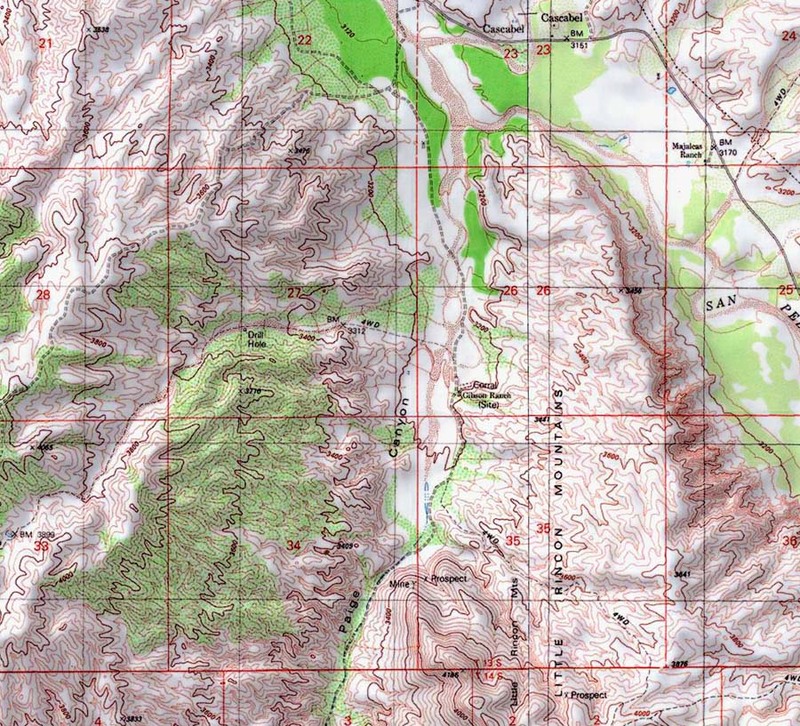 The map below shows the full length of this corridor, running from the Wildernesses of Saguaro National Monument and the Rincon Mountains on the lower left to Cascabel on the upper right, where it meets the San Pedro River. 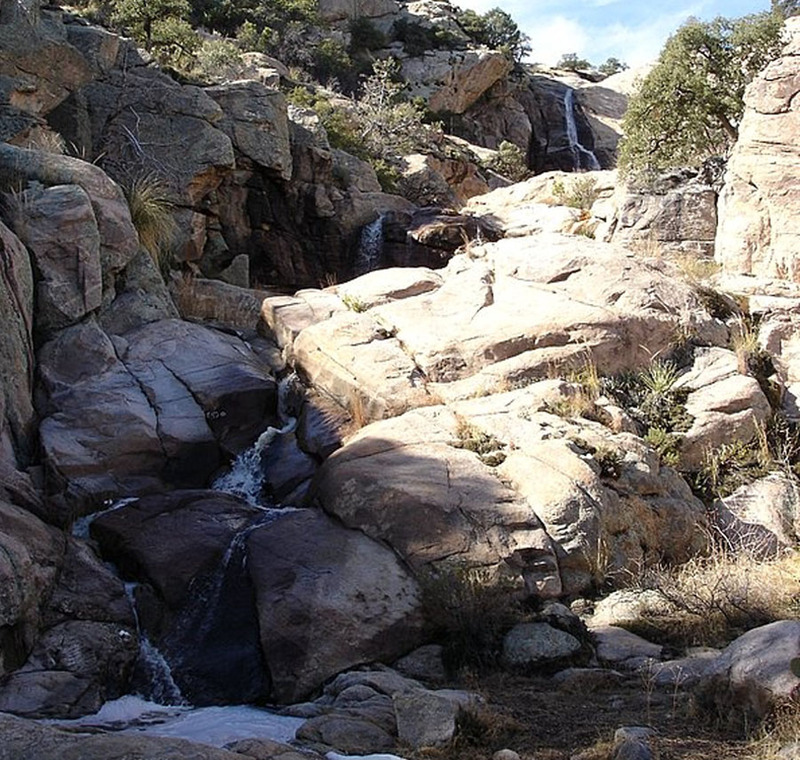 This is a long canyon with numerous side creeks, draining both the eastern side of the Rincon Mountain Wilderness and the western ridges of the Little Rincon Mountains. 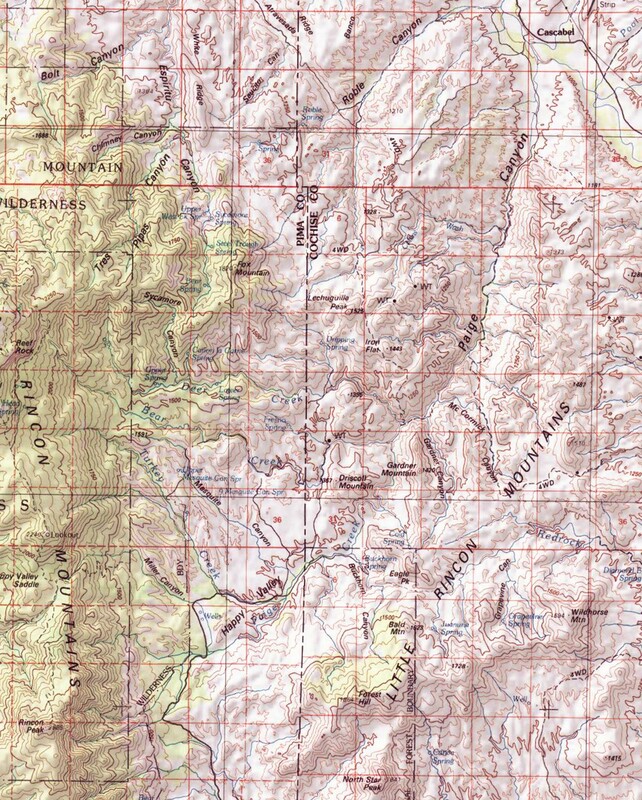 Click on the map for a larger view. 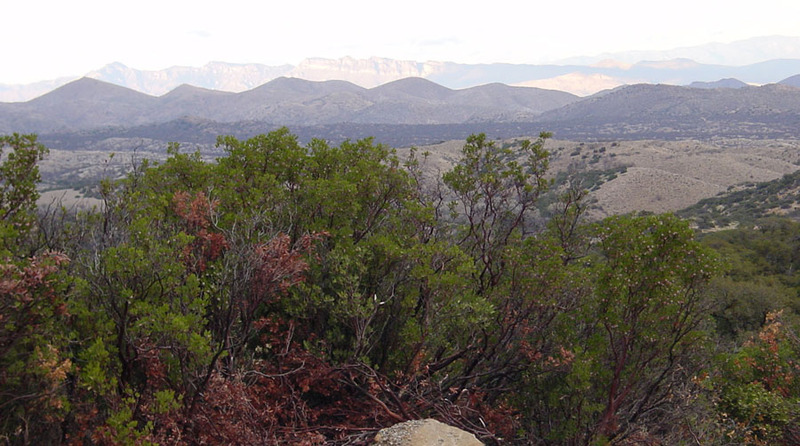 Below, a view from the hills above Mescal town looking north toward the valley, which lies beyond the grayish hills in shadow at low left-center marking the saddle between Rincon Mountains (far left) and Little Rincon Mountains (far right). 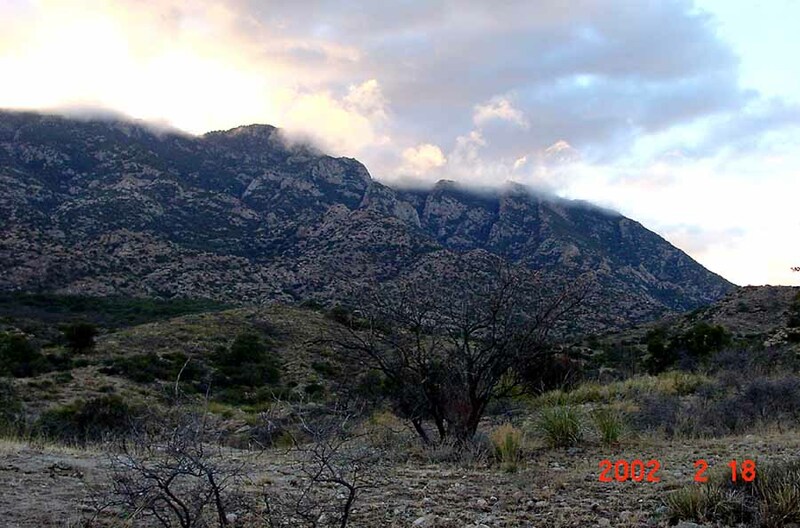 In this image from August 8, 2008, the valley is sunlit beyond the saddle. 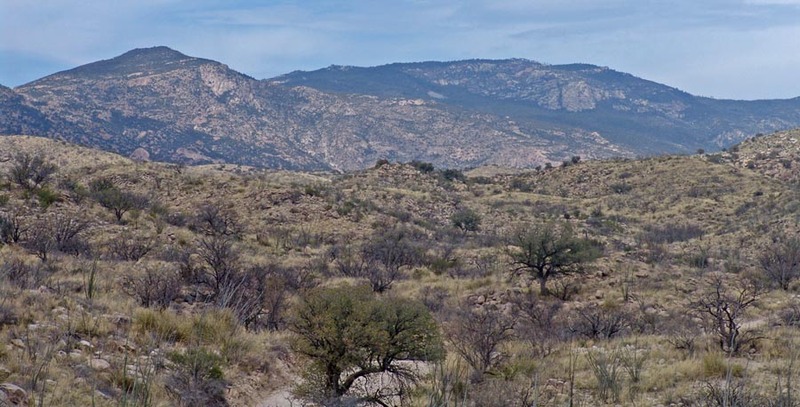 The road from Mescal leading into the valley enters it near the lowest point on the saddle, rising roughly parallel to Ash Creek, which drains the saddle southeastward into the San Pedro River at Tres Alamos. Happy Valley here is a beautiful grassland with some stands of large oaks and sycamores. 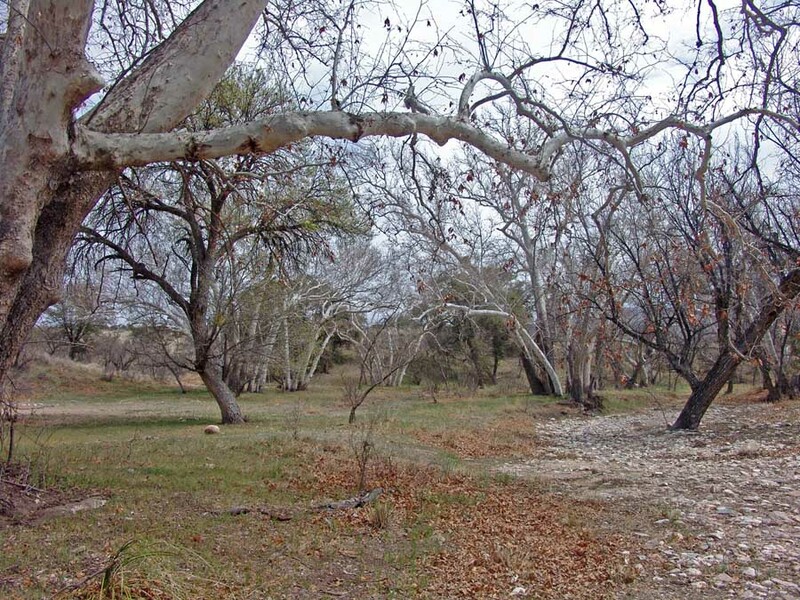 Sycamores are also scattered through the streambed of Miller Canyon. Birders who visit Happy Valley during the summer report seeing a great variety of birds, for example Vermilion Flycatchers, Northern Beardless-Tyrannulet, Brown-crested Flycatcher, Canyon and Spotted Towhees, Rufous-crowned, Cassin's, Botteri's, Black Throated, Lark, Brewers, and Chipping Sparrows, Lark Buntings, Wilson's, Nashville, Townsend's, Yellow, Black-throated Gray Warblers, Common Yellowthroat, Painted Redstart, Scrub-Jay, Crissal Thrasher, Mexican Jay, Bridled Titmouse, Ash-throated Flycatcher, Cassin's Kingbird, Bell's Vireo, Lucy's Warblers, Black-tailed Gnatcatcher, Hutton's Vireo, Summer Tanagers, Cooper's, Gray, Zone-tailed Hawks, Hooded Oriole, and Montezuma Quail. Happy Valley is important wildlife habitat, but it is also highly vulnerable to development. Dirt road and remoteness protect it somewhat for now, though on our visit of March 20, 2008 we saw a squirrel that had been shot dead while standing on a stump beside a lower reach of the Mescal road and a gray fox road-killed along the valley floor road. (Someone had driven at inappropriately high speed there.) With further development Happy Valley, given its considerable amount of private land, would become attractive to bedroom commuters. Ash Creek Road would be paved, and the suburbanizing consequences would inevitably follow as this impressive wildlife corridor would become blocked for terrestrial animals. The mountain shown at right-center at the bottom of the map corresponds to the one in the photo below, taken from the north at Cascabel Community Center on May 20, 2008. This is Paige Peak, its massive body looking like a giant prone multilegged monster whose head is bowed low to drink out of Paige Creek (whose lower flanks run across the photo from middle right to lower mid-photo). 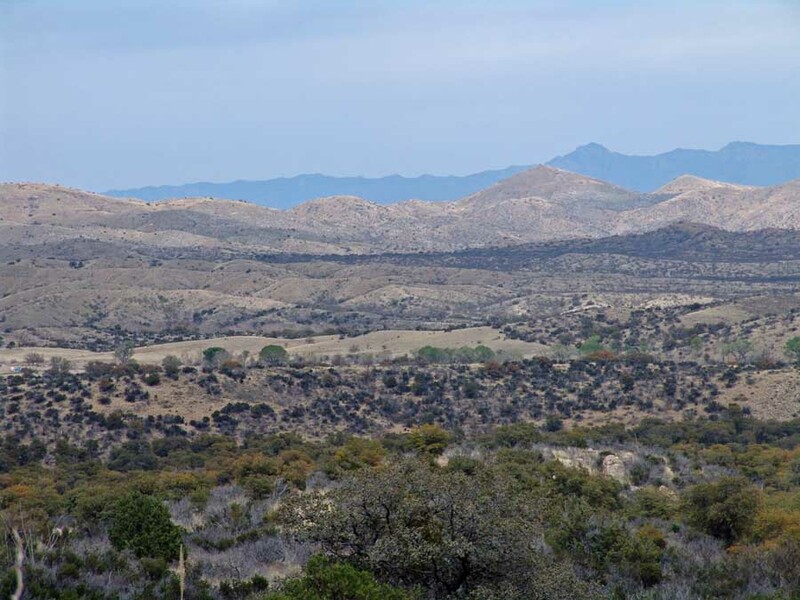 The San Pedro River channel runs across the photo from lower left to right.